Jubilee Lock and Key is a minority owned local Baldwin County locksmith business. It was started by Beryl Adkisson, a retired nurse, and her son David. 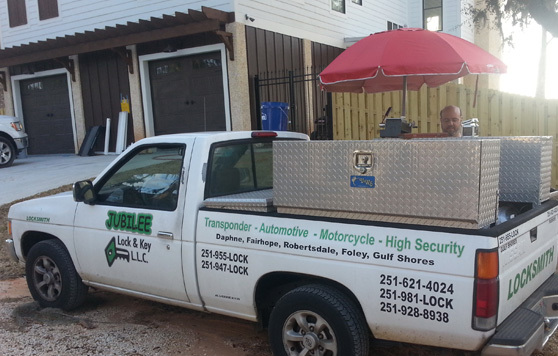 Jubilee Lock and Key offers complete lock and key services in Daphne, AL, Spanish Fort, Fairhope, Foley, Gulf Shores, and Orange Beach Alabama. We offer a mobile lockout service throughout all of Baldwin County for both residential and commercial clients. All of our associates are drug tested and go through an FBI background check for your safety. We offer competitive pricing and are dedicated to providing FAST, professional service. We also provide emergency services. Call us today for all of your lock and key needs. You can trust us to get you back in your vehicle as quickly as possible and at an affordable price. Learn more about our history helping people in our area.